August started very hot again with little or no rain and temperatures in the 30’s. Most of the clubs on the river Wye had stopped fishing. The only people that hadn’t done so was the Wye and Usk Foundation. Which I found to be very strange. This is a short video showing my meadow from my drone. You can see there is little green in there. It’s now August the 14th and Hereford are lifting the ban so I expect others to follow. Rainfall has been still very short and soaked into the ground and trees have been slurping it up for sure. Many of the trees in my garden have started to drop leaves to protect themselves. The rivers have not risen much however with the air temps coming down to 24c then the dissolved oxygen will slightly higher. Andy (you should have been here yesterday) Cowley and I were going to the H.Avon for a couple of days fishing. I was fishing one day and then guiding on Throop the next then returning to the Avon the following day. We were both fishing different area’s so we didn’t meet up first thing. I wandered around at first trying to find some barbel and sure enough I found a good few. Some I could feed others just didn’t hang around. I lost one barbel where it took me into a snag quicker than my thought process could manage. I was fishing mid river too. Buggar!! I just knew I was going to get a take I stood with the rod in my hands that’s how positive I was thinking. The fish though was much too powerful on one of it’s runs and just managed to touch a willow branch. 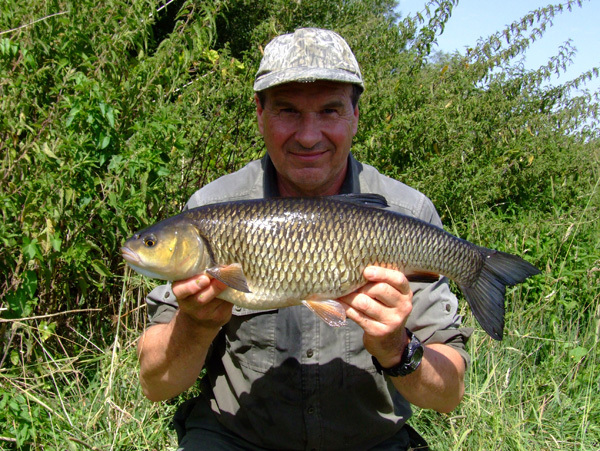 I chased another barbel watching it move around the swim but didn’t pick up the bait. I gave it 3 hrs then decided to move on. In area’s where barbel were drifting in and out of the luxurious weed it was barren of fish, so they must have been pressured and moved off. I did find a couple of other swims on a different stretch where there were up to 6 fish in the swim. 2 doubles, then 2 at about 9lbs and 2 much smaller. They were feeding well on the pellets I was giving them. It was noticeable that there was one particular area where they spent ages getting at every pellet. I reckon I spent 2 hrs watching them before casting out. I lowered the bait down silently into position. One of the bigger fish came to look at the bait picked it up and then bolted off however not with my hook in it’s mouth. Things became a bit cat and mouse for a while. Finally with 6 fish in the swim I just knew one would trip up. Sure enough one did however it was one of the smaller barbel. Again I saw it move towards the bait, flare it’s gills and bolt off downstream. I was in control for the entire fight with it not doing much. She wasn’t huge but worthy of a photo. I rested her up until I got the camera and weighing stuff sorted. Well feeling pleased with the result I wanted to get her back in the river. I lowered her back in, then some bubbles started to come from the bottom of the net. Then it dawned on me that my Korum electronic scales were tangled in the net. First priority was the fish then the scales. The fish swam off OK. I then tried to get the scales out using the net. Mistake I knocked them into deeper water. That was it I lowered myself into the river tired to retrieve them with my left hand. Nope. Then with my right hand and bingo yes. Each time I was up to my neck in water. Of course I was soaked however at 30c it was a welcome cooling off. I decide to call Andy to see if he could help and sure enough he could. So he came to my rescue with a spare set of scales. My boots were soaked so it was on with the trainers for the remaining hours of the day. Andy had caught a very respectable chub of 6lbs 7oz earlier in the day so he was well pleased. He went off to find more barbel and chub. 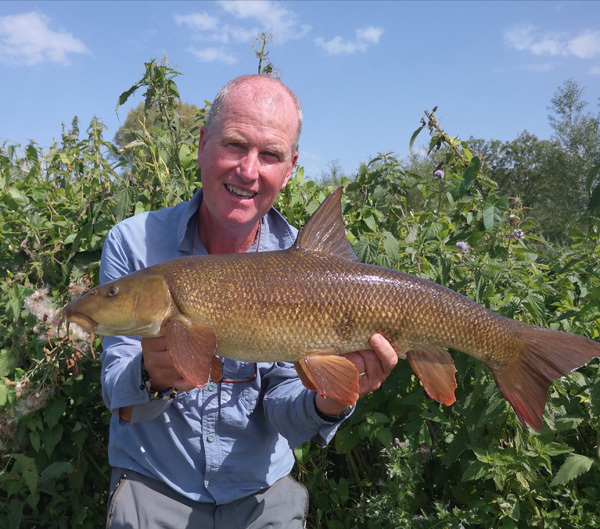 I stayed as one or two barbel were still coming in and feeding. Nothing much came along though and stay to feed. So by the end of the day at 6.30pm I had enough dry but tired I went back to the house to get some food for us. Andy wasn’t far behind me. A quick look and we decided to get fish and chip. Oh no closed so I cooked Lasagne and chips for the two of us and combined with a couple of ciders it was time for bed. I had to be away early in the morning to meet David at 7am on the Stour at Throop. This entry was posted on Wednesday, August 15th, 2018 at 2:53 pm	and is filed under Uncategorized. You can follow any responses to this entry through the RSS 2.0 feed. Both comments and pings are currently closed.